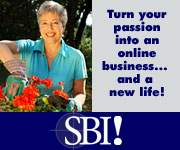 Yes starting your own homebased internet business around your passion! Errr hobbies, interests something you know how to do. Coming up with an idea for an internet homebased business is often the hardest part for most people. When I talk about this it is often like pulling teeth. When I ask the question..what do you enjoy doing. It's funny how most people think of themselves as boring and ignorant. Not true! Think about the books you read, what you do in your 'spare' time or even if you are one of the lucky ones that like what you do at work. With a little thought I'm sure you can find 'something' that would be of value to others.